Synchronize the cube. 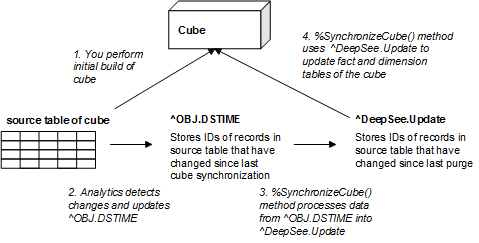 The cube synchronization feature (also known as the DSTIME feature) enables InterSystems IRIS Business Intelligence to keep track of changes to the data. You periodically synchronize the cube to include those changes. Depending on the cube implementation and depending on which data changes, it may not be possible to use this feature; see “When Cube Synchronization Is Possible,” later in this chapter. For information on the Cube Manager, see “Using the Cube Manager,” later in this chapter. Or you can write and use a utility method or routine that builds your cubes in the appropriate order. For any cube that uses more than 512,000 records (by default), the system maintains and uses a result cache. For any combination of update techniques and tools, you should also carefully consider the frequency of cube updates, because any update could invalidate parts of the result cache. For large data sets, the system maintains and uses a result cache for each cube as follows: Each time a user executes a query (via the Analyzer for example), the system caches the results for that query. The next time any user runs that query, the system checks to see if the cache is still valid. If so, the system then uses the cached values. Otherwise, the system re-executes the query, uses the new values, and caches the new values. The net effect is that performance improves over time as more users run more queries. When you update a cube in any way, parts of the result cache are considered invalid and are cleared. The details depend upon options in the cube definition (see “Cache Buckets and Fact Order,” earlier in this book). Therefore, it is not generally desirable to update constantly. When InterSystems IRIS™ detects a change within the source table used by a cube, it adds entries to the ^OBJ.DSTIME global. These entries are to indicate which IDs have been added, changed, or deleted. Then InterSystems IRIS uses the ^DeepSee.Update global and updates the fact and dimension tables of the cube, thus bringing the cube up to date. The base class for the cube is a linked table. (See “The Link Table Wizard” in Using the InterSystems IRIS SQL Gateway). If you use Business Intelligence on a mirror server, note that the ^OBJ.DSTIME global is part of the application data and should be mirrored (if it mapped to a different database, for example, that database should be mirrored). The ^DeepSee.Update global is generated by Business Intelligence code and thus is present only in the database that contains the cube definitions and data. For a discussion of using Business Intelligence on a mirror server, see “Recommended Architecture” in the first chapter of this book. The system removes unneeded entries from the ^OBJ.DSTIME global when you synchronize or rebuild a cube. Make sure that cube synchronization is possible in your scenario. See “When Cube Synchronization Is Possible,” earlier in this chapter. This parameter primarily affects how entries are stored in the ^OBJ.DSTIME global; see “Structure of the Cube Synchronization Globals.” The form of the ^OBJ.DSTIME global has no effect on the behavior of the cube synchronization mechanism. This section describes how to clear the ^OBJ.DSTIME global. In some cases, you might want to periodically clear the ^OBJ.DSTIME global. For example, if you are not using cubes in Business Intelligence, you may want to clear the ^OBJ.DSTIME global to free up space. This task clears ^OBJ.DSTIME entries if they aren’t being used by Business Intelligence cubes. Use the Task Schedule Wizard to schedule the task to run as often as necessary. The Cube Manager tasks are visible in the Task Manager, which is discussed in “Using the Task Manager” in the System Administration Guide. InterSystems recommends that you do not modify these tasks in any way. The Cube Manager provides an Exclude check box for each registered group and cube, which you can use to exclude that group or cube from any activity by the Cube Manager. 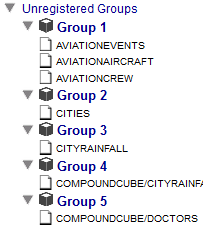 Specifically, the Cube Manager tasks ignore any excluded groups and cubes. Initially these check boxes are selected, because it is generally best to not to perform updates until you are ready to do so. For example, you might want to adjust the Business Intelligence agent counts before building any cubes. Click Analytics > Admin > Registry. White background  The group or cube is included, which means that the Cube Manager tasks update it. See the Exclude option in “Specifying an Update Plan,” later in this chapter. White background  The cube is included, which means that the Cube Manager tasks update it. See the Exclude option in “Specifying an Update Plan,” later in this chapter. Build Cubes Synchronously  Select this to cause the system to build these cubes synchronously (if applicable). If this option is clear, the system builds them asynchronously. The system provides a utility method that you can use to build all the registered cubes, in the correct order. The method is BuildAllRegisteredGroups() in the class %DeepSee.CubeManager.Utils. This method ignores the schedule specified in the registry but uses the build order specified in the registry. Before you can synchronize a cube, follow the steps in “Enabling Cube Synchronization,” earlier in this chapter. Call the REST API /Data/GetDSTIME. See “GET /Data/GetDSTIME” in Client-Side APIs for InterSystems Business Intelligence. Pass, as an argument, the full name of the source class of the cube. Using the returned timestamp as an argument, call the %PurgeUpdateBuffer() method of %DeepSee.Utils so that you purge ^OBJ.DSTIME up to but not including the timestamp processed on the remote server. The default behavior for this method is to increment the top node of the local ^OBJ.DSTIME so that every purge will provide a new sync point to be propagated to the Business Intelligence server. By default, the system populates the dimension tables at the same time that it builds the fact table. It is possible to prebuild one or more dimension tables so that they are populated before the fact table, if this is necessary for some reason. The system uses this argument and the pCubeName argument to determine the table and row to update. Open the User Portal in the namespace where you installed the samples. This action calls a method that randomly changes the favorite color for some percentage of the patients. In this case, the changed data is stored in the BI_Study.PatientDetails table, which is not the base table for the Patients cube. Hence it is necessary to use %ProcessFact() instead of %SynchronizeCube(). This action calls a method that includes logic similar to that for BI.Study.PatientDetails; see the previous item. This action calls a method that includes logic similar to that for BI.Study.PatientDetails.